Pacific Rim 2 is getting a sci-fi genre fan-favorite, and it's a pretty big deal! It may be a little hard to believe, but it has already been three years since Guillermo Del Toro brought Pacific Rim to the big screen. Though the film didn't quite kill it at the domestic box office, it did do pretty well internationally and spawned comic books, an in-development animated series and a whole lot of merchandise, so the franchise potential is there and a sequel is on the way. Though a lot of focus has been on who won't be returning, we finally got word on a huge new addition to Pacific Rim 2. According to a new report from Deadline, Star Wars: The Force Awakens star John Boyega has been tapped to not only star in the film, but to take on the lead. Boyega will be playing the son of Idris Elba's character from the first Pacific Rim movie, who of course won't be returning for reasons relating to him no longer being alive. Legendary Pictures made the casting official, which seems like something of a no brainer after the success of The Force Awakens. Del Toro had nothing but nice things to say about Boyega and the decision. "I am very proud and happy to welcome John into a fantastic sandbox. The Pacific Rim universe will be reinforced with him as a leading man as it continues to be a multicultural, multi-layered world. 'The World saving the world' was our goal and I couldn't think of a better man for the job." Speaking of Guillermo Del Toro, he will unfortunately not be returning to the director's chair for Pacific Rim 2, but it is his creation so he will remain involved as a producer. Daredevil showrunner Steven S. DeKnight has been tapped to direct this second sic-fi thriller, which is slated to begin production later this year. As of right now it is unclear exactly what cast members from the original will be returning, but with Boyega in the lead, it seems perhaps less likely that Charlie Hunnam will be back, being that he was the lead in the first film. Or, he could be a co-lead alongside Boyega. The first Pacific Rim made $411 million worldwide, which is a pretty decent haul just as a number itself. However, when the reported $190 million price tag is factored in, which doesn't account for marketing costs, the number is much less impressive. It was enough to justify a sequel though, but the shaky numbers have likely contributed to the delay in getting the project off the ground. Related: Will Pacific Rim 2 Finally Dethrone Black Panther at the Box Office? 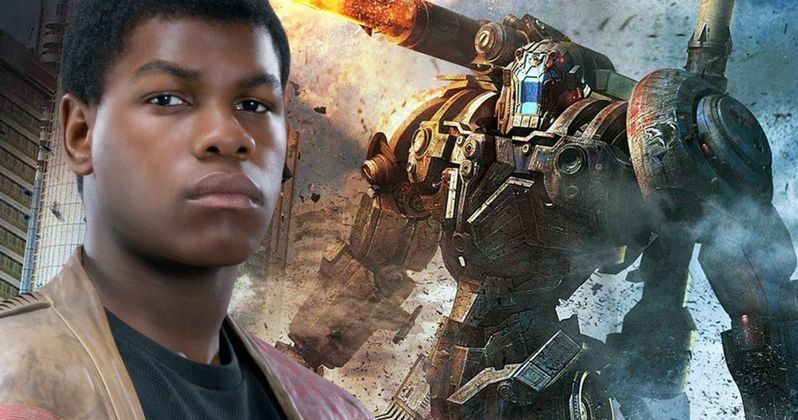 With the uncertainty and shakeups that have surrounded Pacific Rim 2 up until now, Boyega's casting is a nice bit of information that helps let fans know that things are moving in the right direction. Boyega will be seen next in The Circle alongside Tom Hanks and Emma Watson and of course, he will be reprising his role as Finn for Star Wars Episode VIII. Be sure to stay tuned as we will likely learn a lot more about Pacific Rim 2 and the second fight against Kaijus in the coming weeks. First Pacific Rim 2 Reviews Arrive: Is It Better Than the Original?